The very first R.L. Stine book that I read was The New Girl (see my prized book above) and I was instantly hooked. I was too young to be going to the book shop on my own back then so I had someone get the books for me. Dull days became interesting (think magical car like the one in the Cataluna Chronicles), and hot summer days just became a little bit chilly (thanks, 99 Fear Street). When I entered high school I was just so relieved that my school wasn’t populated with students straight out of Shadyside high (maybe, I don’t know), though the books sure did make a good source of daydreams while the teachers droned on and on. Hearing that R.L. 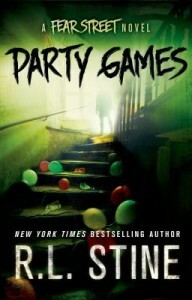 Stine is coming out with Party Games (you can read Chapter 1 here) after twenty years brings back a lot of memories like the scent of new books and the excitement of having a pile of books waiting to be read. I can’t wait to read it and relive taking that stroll (or maybe run) down Fear Street once again.